The Sheep Whisperer: No Lion Here! 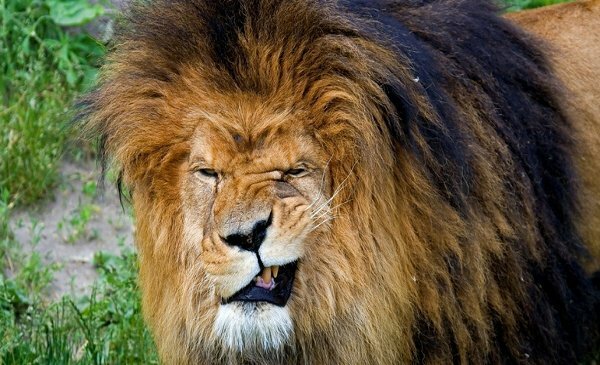 The Lion is big-cat predator that is traditionally known as the "King of the Beasts." 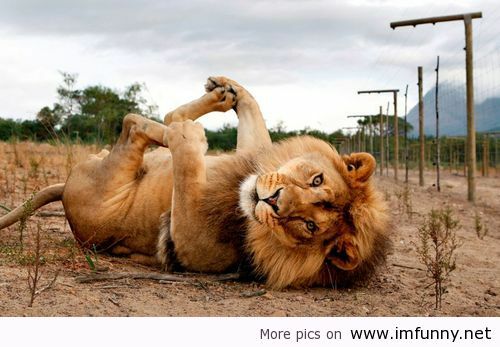 Lions have strong muscular bodies & very powerful jaws! Lions will attack much larger animals & are feared in their natural habitats! Lions run up to 50 mph & weigh 300 lbs. as females, & up to 500 lbs. as males! A lion's roar can be heard from 5 miles away! Being "King" allowed me to get a second job of acting in the movies! Extreme times require extreme measures! 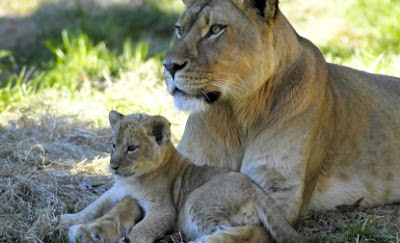 Lions are very social animals & form groups, or prides, of about 40 lions. Prides are led by one or two males, distinguished by long, dark manes! Prides also include several females, cubs, & fairly young males.The male's role is to protect the 100 sq. 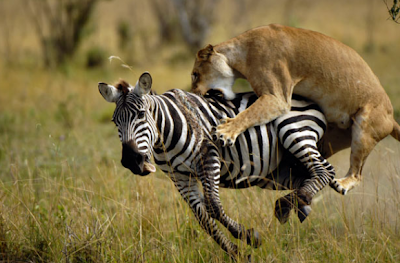 mile area, while the lionesses' role is to do the hunting. Zebra, antelope, & wildebeests top the menu, however, other animals will also do. Sometimes Ewe have to make the prey do most of the work! Between hunting & child care, What time do I have left to go to Disney? Females have a tendency to stay with the pride, in contrast to young males, who are either chased away, or leave in search of their own prides to rule! Their mission in going to another pride is to defeat the leader & kill or drive away all the male cubs.The average time for a male to reign in a pride is 2-4 years! Did Ewe say only 2-4 years as King? Are Ewe sure that's all I have? Did Ewe know I need 10-15 lbs. of meat a day? 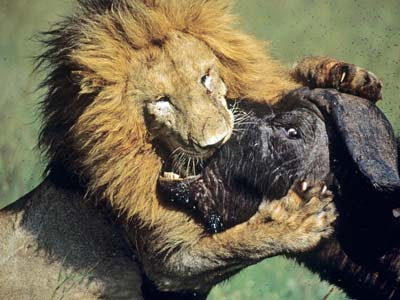 Lion 1 Buffalo 0! poor survival rate, with only 1/4 expected to make it to adulthood!They are at risk, mostly from other animals & a lack of food. 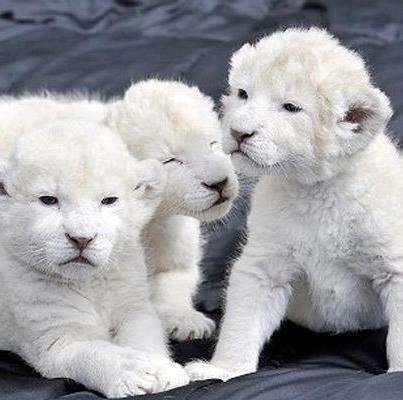 White lion cubs are a rare occurrence! I have a great life, while it lasts! I live about I5 yrs. in the wild! Sheep don't share much in common with lions.Sheep are prey, & run from animals, while lions are predators & run after animals. 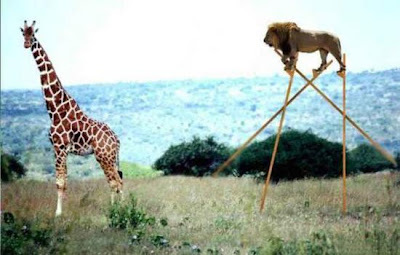 Sheep are herbivores , while lions are carnivores! Sheep have a Shepherd , while Lions live on their own in the wild! One thing they do share in common is that they both hang out in community!Lions have close-knit prides, while sheep flock together in herds! Life is Good under the Shepherd's care! Don't worry, Be Happy! As we draw even closer to celebrating the precious birth of our Saviour, enjoy Ewe-r day! 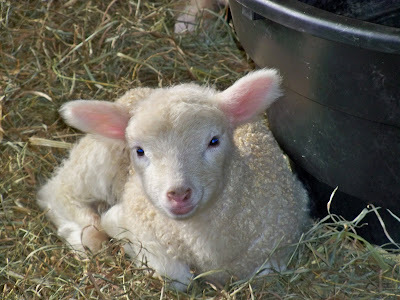 Journey today knowing that He is always caring for Ewe with an endless supply of His Love! Love it DAD And I'm not "Lion"!!! 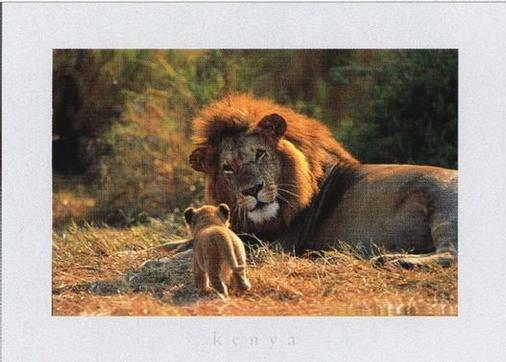 Very clever my little lioness! I'm glad Ewe love it! God Bless Ewe & Thank Ewe for Commenting!